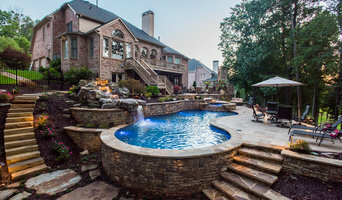 Georgia Classic Pool® is the Premier Custom Inground Swimming Pool Designer and Builders serving the north metro Atlanta Georgia area. We specialize in building amazing outdoor living spaces to complement our award winning swimming pool projects as the focal point of your backyard. We can design and build your cabana, arbor, pergola or outdoor kitchen. Outdoor Living can be achieved year-round in the Atlanta area and we are here to help you get the very most out of your backyard living space. Originally from upstate New York, Chris relocated to northeast Georgia in 1997. Before Amazing Scapes, he initially worked for another local landscape company, and later became part owner in a nursery venture. These experiences allowed him to learn about popular north Georgia plants and landscape requirements while establishing himself in his community. Those acquainted with Chris are aware of his strong work ethic and can-do attitude. He values the relationships he builds with his customers, many of whom become friends. Amazing Scapes is a full service landscape company specializing in lawn maintenance and custom hardscapes for the enhancement of your outdoor living space. We are your one stop shop for anything outdoors. Amazing Scapes and More began as a lawn maintenance company in 2001. With the Chris’ experience in hardscape creation, retaining walls, drainage, and irrigation, over time we continued adding related services to our growing customer base. No need to call on separate contractors to complete each phase of the project, we will handle everything for you We can manage your complete project from initial concept through completion. We specialize in pool installation (Desjoyaux Pools), complete landscaping, outdoor kitchen or living space and completing with fencing in the pool area or around the entire back yard. Amazing Scapes and More continues to provide local lawn care and landscape service providing the solution to all your lawn maintenance and landscaping needs.. We pride ourselves in giving a strong personal touch to each property we service. Whether you are having a brand new irrigation system installed, your lawn mowed and hedges trimmed, or having a paver patio and outdoor fireplace installed, you will receive a high quality job by our professional and friendly crew. We work directly with each client to ensure you are more than pleased with the final product. We realize that your landscaping is very important to the image and value of your property. With this in mind, we constantly strive to surpass your expectations and offer quality workmanship and customer service that will separate us from the rest in our local industry. Quotes for any project are free, simply call our office to schedule a meeting to discuss your project in detail. For over a decade, Sandals Luxury Pools has provided the residents of Atlanta and North Georgia with turnkey swimming pool installations and other outdoor amenities. From the design to the last piece of sod, Sandals will take care of the entire project. We call our simple building process the design-build-landscape approach. These simple steps save our customers money, time, and the headache of hiring multiple contractors that may not provide the same quality work. This approach works well on every project no matter how big or small. Why Choose Sandals To Be Your Swimming Pool Contractor? • Our detailed designs let you see what your getting before we begin the project. • Our quality craftsmanship is affordable and our products are top of the line • Our price will not change unless changes are made to the design • Our clients deal directly with the owner to eliminate the risk of miscommunication • Our step by step process is simple and easy to understand If your considering a swimming pool, Sandals can handle the entire process or just provide assistance if you decide to do it yourself. Let us help you make this large investment a simple one. International award-winning design-build firm. We focus on customized and integrated design and thoughtfully crafted installation. As the Atlanta area's premier outdoor living company, customers rely on us for their luxury swimming pools, premium landscapes/ hardscapes, fireplaces and outdoor kitchens. Each team member of Hearthstone Luxury Pools + Outdoors has developed complimentary skills and have come together because of similar interests and drives. We carry degrees in Architecture and Design and have been working in various design related fields for over 15 years. We are extremely thankful for the talents that we have been blessed with and are excited to share them with you. We established Heathstone with the focus of making a new breed of company that breaks away from the standard model. We focus on our customer's wishes and are not satisfied until our customer is. We are constantly challenging ourselves to improve and help our customers make their dream backyards a reality. Aqua Design Pools & Spas, LLC is a family owned and operated business serving North Georgia and Metro Atlanta for 16 years. Company founder Jeff Umberger has been in the swimming pool industry since 1983, when he began working with his father-in-law and learned the trade hands-on. Building a team of talented workers around him over the years, Jeff has brought his son into the business as well. With a true talent for design, we have received numerous awards and national recognition for the beauty and ingenuity of our work. Jeff is personally involved with each project from conception to completion to ensure only the highest quality workmanship and materials go into every project. He stakes his reputation on designing and building a swimming pool of excellent craftsmanship and beauty that you and your family will enjoy for years to come. The entire family at Aqua Design Pools & Spas, LLC takes pride in the quality of our work and our customer service. We stand behind every pool we build to ensure total customer satisfaction. This dedication to exceeding our clients' expectations is evident not only in the spectacular swimming pools we create, but also in the numerous glowing referrals we receive year after year. We believe in more than building just swimming pools; we build relationships. Our breathtaking designs and extraordinary craftsmanship create outdoor living spaces that blend with the natural surroundings to create an oasis of tranquility. We work with you every step of the way to create a unique outdoor environment that is a reflection of your lifestyle. We have extensive experience in dealing with challenging lots and offer flexible designs to fit any budget. In addition to designing and building new custom swimming pools, we also perform custom pool remodeling and pool modernization. Our expertise does not stop with swimming pools. Aqua Design Pools & Spas, LLC can craft an entire outdoor living space complete with a kitchen, unique water features, fireplaces and more. When you choose Aqua Design Pools & Spas, LLC to build your pools, you can feel confident you have chosen the right company to integrate your dreams with reality! We are a third generation family owned business. We have won numerous awards over the years and have the highest satisfaction rating in the business. 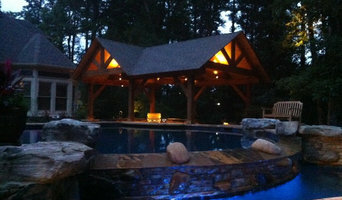 We work with our customers to provide a custom pool and/or spa along with any other outdoor projects you may have! Making your backyard dreams come true is our goal! Contact us today to collaborate on your upcoming outdoor project! Swimming pool and spa design and construction. Specializing in all types of pool construction, including hillside projects. New construction and remodels. At Precision Pool Renovations, we specialize in pool renovations. We are not a pool builder or a pool maintenance company. Our focus is 100% renovation. Our approach to each pool remodeling project is the same: Provide a clear contract of the scope of work, install the finest quality materials by highly-skilled pool professionals, maintain job safety and cleanliness, and deliver a beautiful end product. Our team is made up of leading industry professionals with many years of on-the-job experience. Additionally, our staff is dedicated to promoting professional standards and remains committed to adding to our annual continuing education credits. What does this mean to you? It says we are up to speed on the latest trends and standards and we have the experience to know when to use that knowledge. Give us a call today to discuss your pool project! RCS Pool and Spa is your neighborhood source for new construction and renovation of custom inground swimming pools and spas. We are family owned and operated and we are based in Atlanta. We can custom design a pool and spa to meet your needs, your landscape, your lifestyle and your budget. Your inground pool design is almost as personal and unique as a fingerprint. Every backyard is different with different challenges AND unique opportunities. Atlanta Georgia Swimming Pool Contractor, “Merodynamic Pools” is an award winning vinyl swimming pool installation and renovation pool company. BBB Accredited and known throughout Georgia for our “Customer is King” Policy and our award winning 5 star customer pool service. Our Specialties include: In Ground Swimming Pool Installs, Vinyl Pool Liner Replacement, Pool Safety Covers and Hot Tub Spas. With several Financing Options Available, Free Estimates and Great Pricing why wouldn’t you call our professional and courteous staff today? Merodynamic Pool builders continually maintains our “Swim in 2 Week” Integrity. Our in ground vinyl liner swimming pools look extravagant. We perform precise swimming pool construction so our pools last forever. At Merodynamic Pool & Spa we look for lifetime relationships. We now serve a 50 mile radius of Atlanta Georgia including all surrounding counties and cities. Call or visit today and let us show you how our “Experience” is the Merodynamic Pools “Difference”. We will beat any local and reputable pool builders price! Call Now 770-720-9905 God Bless You and Yours! Swimming pool/spa design/construction. 35yrs. experience in outdoor living space enhancement. Pools, spas, landscaping, water features, stone walls, fencing, and decks are just a few of the many elements utilized to increase the value of the backyard living space. Mount Zion Pools is a full service design and build inground swimming pool and hardscape construction company, where we can design ant style swimming pool, outdoor kitchen, fireplace, retaining wall and water features you may desire. Mount Zion Pools has all inhouse services and does not sub-contract any aspect of the pool installation process, even the design and engineers are all inhouse. This keeps cost to a minimum while promoting the highest project quality available. Superior Pools & Maintenance, Inc.
What exactly do Gainesville pool builders do? If you are planning for a new pool in Gainesville, GA, a swimming pool builder will analyze your outdoor space and your aesthetic wishes to determine an appropriate design for your yard, installing it once the plan is developed and approved. Once installed, some pool companies in Gainesville, GA can handle the necessary cleanings, water testing, renovations and equipment replacement or repairs for your pool or spa. If not, many can also suggest Gainesville, GA swimming pool contractors or maintenance services to help with upkeep or repairs down the road. Here are some related professionals and vendors to complement the work of swimming pool builders: Garden & Landscape Supplies, Landscape Architects & Landscape Designers, General Contractors, Landscape Contractors, Solar Energy Contractors. Before hiring a swimming pool construction company to create your new Gainesville, GA pool, determine how you'll be using it. Will it be for fun or for lap exercise? Will the primary users be children, adults or a mix of the two? Knowing the use can help you find Gainesville pool builders who shares your aesthetic. Once you find swimming pool builders in Gainesville, GA who share your style, research is critical. Review customer references and comments, collect at least three to four estimates to compare, meet with potential Gainesville pool designers and builders in person and ensure that they are Georgia certified service professionals and licensed with the registrar of contractors before making any final decisions. In addition, get a sense whether they plan to complete the pool installation and be done with it, or whether they seem interested in building a long-term relationship with you. Be wary of the former: it's likely a reflection on the level of quality of the pool construction they do. Find a Gainesville pool contractor or designer on Houzz. Narrow your search in the Professionals section of the website to pool builders in Gainesville, GA. You can also look through Gainesville, GA photos by style to find a pool or spa you like, then contact the local pool company who designed it.